These elegant waterfowl may be found in the pond area of Connecticut’s Beardsley Zoo’s New England Farmyard area. In the wild, while rare in Connecticut, they do occasionally visit nearby salt marshes during a migratory stopover. They are similar to the slightly larger, more common Trumpeter Swan. Tundra Swans have heavy bodies and long necks. They are covered in white feathers. When they fly, the wind moving through their wing feathers makes a characteristic whistling sound that gives them their nickname. They sleep on the water in winter but during the breeding season they usually sleep on land. Tundra Swans are covered in white feathers. Their beak, legs and feet are the only part of Tundra Swans that are not white. They have black beaks with a smudge of yellow at the base. The legs and feet are also black. Young Tundra Swans have a gray tint to the feathers on their wings, necks and head. Once mature, they will be the characteristic white associated with swans. Their long necks are stretched out straight in line with their bodies as they fly but when on land or water they hold their heads up tall on their necks. They often forage in water like dabbling ducks, which means they dip their heads and necks into the water and their body tips up with their backside pointing up to the sky. They can take off into flight from water or land. Their bodies are between 3 and 5 feet long. They have a 66-inch wingspan. They can weigh between 8 and 23 pounds. They like to nest along water, both fresh and salt. Inland nesting sites are below the treeline and may be near agricultural fields where they can forage. 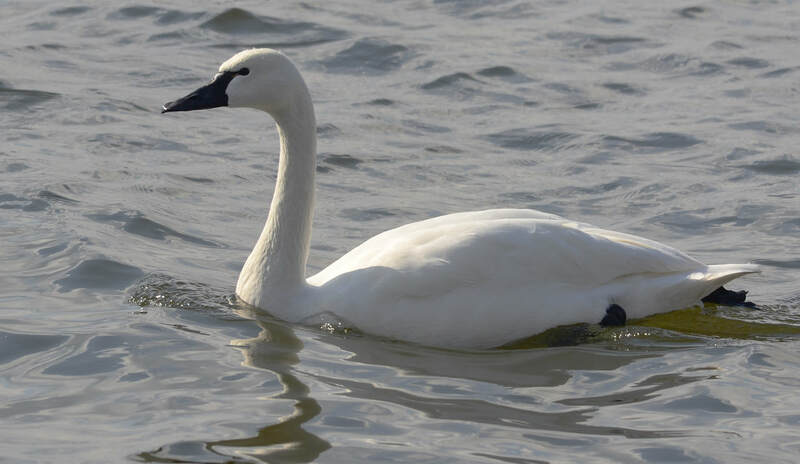 The Arctic tundra of North America is the nesting home of the Tundra Swan, but they visit the United States during migrations and in the winter months. When they leave the tundra, they are usually found in coastal waters or inland lakes. They sometimes visit agricultural fields to feed. Omnivore. Although most of their diet consists of plants, they will also eat shellfish and arthropods. They form huge flocks except during breeding season. Both parents build and protect the nest that contains between 3 and 5 eggs each year. Both parents defend their young from predators. If they sense a large predator approaching their nest, they often leave their nest quickly to make it harder for the predator to find. Mature swans often form pair bonds that feed and roost together within the flock for life. Hatchlings are born with their eyes open. The chicks are covered in light gray down. Their legs and toes are light pink. They are able to walk several hours after their down dries. And they are able to fly 65 days after hatching. Young swans are called cygnets. The average life span is 20 years in the wild.